Who invented the Periodic Table? The name of the person credited with inventing the Periodic Table and the formulation of the Periodic Law is Dimitri Mendeleev (1834 - 1907). Dimitri Mendeleev is not only famous as the Russian inventor of the Periodic Table but also as a physicist, chemist and meteorologist. Mendeleev is often referred to as the "Father of the Periodic Table". When was the Periodic Table invented? Dimitri Mendeleev invented the Periodic Table in 1869, during the Second US Industrial Revolution / Victorian period of invention (1850 - 1914). Definition of the Periodic Table: The Periodic Table is defined as a chart showing all known atoms (chemical elements). Each element has different properties and characteristics. An element can be a solid, gas or liquid. The chemical elements are arranged in order of atomic number, usually in rows, so that elements with similar atomic structure (and hence similar chemical properties) appear in vertical columns. Fact 1: Who invented the Periodic Table? The Periodic Table was invented by Dimitri Mendeleev in 1869 during the Second US Industrial Revolution era of inventions (1850 - 1914) The pioneering work of many other leading scientists led to the Invention of the Periodic Table. Fact 2: Who invented the Periodic Table? Prior to the invention of the Periodic Table in 1869, there were a number of scientific breakthroughs. In 1661 Robert Boyle marked the beginning of the history of modern chemistry with some of the earliest ideas of atoms, molecules, and chemical reactions. Fact 3: Who invented the Periodic Table? In 1778 Antoine Lavoisier wrote the first extensive list of 33 elements & distinguished between metals and non-metals. Fact 4: Who invented the Periodic Table? In 1828 Jakob Berzelius developed a table of atomic weights & introduced letters to symbolize elements. In 1864 both John Newlands and Lothar Meyer made significant advances. John Newlands put forward his law of octaves and arranged the known elements in order of atomic weights. Lothar Meyer developed an early version of the periodic table, with 28 elements organized by valence. (The valency of an element is a measure of its combining power with other atoms when it forms chemical compounds or molecules). Fact 5: Who invented the Periodic Table? Although many scientific advances had been made in relation to the elements no one had found a pattern for all the elements. Dimitri Mendeleev found a pattern and called it the Periodic table from the notion of the arrangement of the tabulation, in which similar properties recur at intervals in elements in the same area as you read down the rows of the table. Fact 6: Who invented the Periodic Table? The inventor of the Periodic Table, Dimitri Mendeleev, was born on February 7, 1834 in Tobolsk, Siberia, Russia and died on 2 February 1907. Fact 8: Who invented the Periodic Table? Following his education he contracted tuberculosis and became a science teacher during his recuperation from the illness. During this time he studied the optical mechanics of the Spectroscope and in 1861 wrote a book on the subject. Later that year Dimitri Mendeleev published a textbook named 'Organic Chemistry' and was awarded the Demidov Prize of the Petersburg Academy of Sciences. The 'Organic Chemistry' was his first big step towards inventing the Periodic Table. Fact 9: Who invented the Periodic Table? On April 27, 1862 Dimitri Mendeleev married Feozva Nikitichna Leshcheva and the couple moved to Saint Petersburg where Mendeleev became a professor at the Saint Petersburg Technological Institute and the State University. Fact 10: Who invented the Periodic Table? His role as a teacher and professor and is deep interest in the elements led Dimitri Mendeleev to invent the Periodic Table. He became determined to simplify the study of chemistry for his students. Fact 11: Who invented the Periodic Table? Dimitri Mendeleev realized that a complete study of one element of a chemical family made the study of the other members a much simpler task, because so many of the properties and chemical reactions of the elements are similar. Fact 12: Who invented the Periodic Table? Dimitri Mendeleev found that by studying and element in detail it was not necessary to study other elements so closely, because most of their properties could be predicted from their relation to the first element that had been studied. Fact 13: Who invented the Periodic Table? Dimitri Mendeleev developed a totally new classification method which he called the "Periodic Table". He included all the 65 elements that were known to science at the time and arranged them in a table by their atomic weights and chemical valency. Fact 14: Who invented the Periodic Table? Dimitri Mendeleev completed details of known elements in his 'Periodic Table' and concluded that the remaining spaces in his Periodic Table indicated that a further group of yet unknown elements must exist. Fact 15: Who invented the Periodic Table? Dimitri Mendeleev went on to formulate the Periodic Law which predicted the existence of new chemical elements. From their position on his Periodic Table he was able to predict, with great precision, the properties of the elements which he was convinced would one day be discovered to fill in the gaps. Fact 16: Who invented the Periodic Table? His theory surrounding the Periodic Law was proven with 15 years when three totally new elements, scandium, germanium and gallium, were discovered. Their properties of scandium, germanium, and gallium remarkably agreed with the predictions of Dimitri Mendeleev. Note: To this day there are still some vacant places in the Periodic Table, especially among the heavier elements. Fact 17: Who invented the Periodic Table? The physical constants of many of the elements did not at first agree with those demanded by the Periodic Law, but when further studies of many such cases were undertaken the results showed that errors had been made. The additional benefit of the combination of the Periodic Table and the Periodic Law was that it corrected errors. Fact 18: Who invented the Periodic Table? On March 6 1869, Dimitri Mendeleev made a formal presentation entitled "The Dependence between the Properties of the Atomic Weights of the Elements" to the Russian Chemical Society, describing elements according to both atomic weight and valence and published his work in the same year. Fact 19: Who invented the Periodic Table? As a result of his discoveries Saint Petersburg was recognized as an international center for chemistry and research. Fact 20: Who invented the Periodic Table? His professional life was a great success but his personal life was not. Dimitri Mendeleev's marriage to Feozva ended in divorce when he became infatuated with and married Anna Ivanova Popova on April 2, 1882. Fact 21: Who invented the Periodic Table? His second marriage branded Dimitri Mendeleev as a bigamist, he had married Anna before his divorce was finalized and in addition the Russian Orthodox Church required at least seven years before remarriage was deemed lawful. The controversy and scandal marked his reputation and he was later denied entry to the Russian Academy of Sciences. Fact 22: Who invented the Periodic Table? 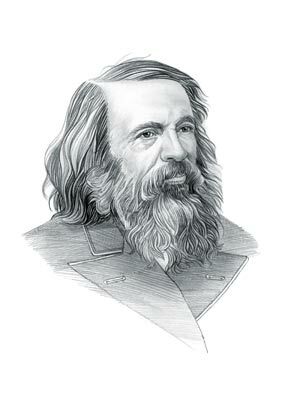 Despite the scandals surrounding his private life outside of Russia Dimitri Mendeleev was generally recognized and acknowledged with the presentation of various awards. However, although he was twice nominated for the Nobel Prize in Chemistry he was never awarded with the most prestigious of all accolades. Fact 23: Who invented the Periodic Table? Dimitri Mendeleev died from influenza on 2 February 1907. He will always be remembered as the "Father of the Periodic Table". Who Invented the Periodic Table - Dimitri Mendeleev - Inventor - Invention - Definition - Meaning - Famous - Important - History - Timeline - Innovation - Significant - Development - Education - First - Definition - Kids - Facts - Information - Info - Who invented the Periodic Table - Dates - When - Why - Impact - Purpose - Use - New - Old - Amazing - Best - Definition - Meaning - Awesome - Cool - - Russian - History - Timeline - Who Invented the Periodic Table?